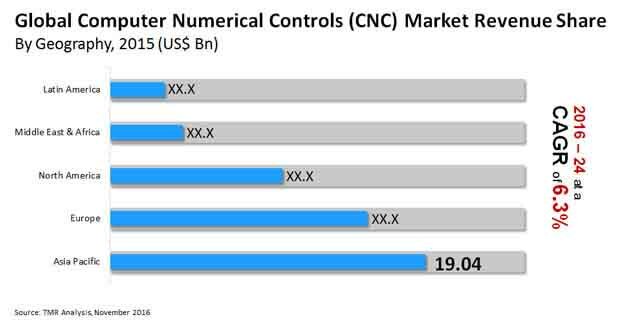 The computer numerical controls (CNC) market is characterized by a highly competitive vendor landscape, mainly due the presence of numerous players in the market. Participating in mergers & acquisitions, focusing on achieving product differentiation, and facilitating product regulation also are prime strategies implemented by most players operating in this market. The competition is expected to intensify with new players entering the computer numerical controls (CNC) market on a regular basis, thus giving rise to a fierce rivalry between individual players. DMG Mori Co. Ltd., Haas Automation, Fanuc Corporation, Siemens AG, Dr. Johannes Heidenhain GmbH, GSK CNC Equipments Co. Ltd., JTEKT Corporation, Takisawa Machine Tool Co. Ltd., OKUMA Corporation, and Yamazaki Mazak Corporation, are chief players operating in the global computer numerical controls (CNC) market. Statistically speaking, the global computer numerical controls (CNC) market is expected to fetch a revenue of US$93.45 bn by 2024, which is a significant rise from an initial revenue worth US$52.68 bn registered in 2015. This growth is expected to occur at a rising CAGR of 6.3% during the forecast period from 2016 to 2024. However, high costs associated with set up of CNC machines is profoundly retraining the market’s growth. This is as a result of low costs making it difficult for small-scale business with low capital to invest in the equipment. Even after the CNC instruments are purchased, they are quite costly to maintain, as they need to be serviced on a regular basis. Therefore, this factor is acting as a chief hindrance affecting the global computer controls (CNC) market. However, a slow-paced change has been occurring in the fundamental working mechanisms of the CNC machines, which is expected to reduce the workload and improve efficiency. Such changes are truly expected to offset some of the restraints affecting the global computer controls (CNC) market. This market is mainly spread across North America, Europe, Asia Pacific, Latin America, and the Middle East and Africa. Of these, North America lead the pack with maximum revenue earned owing to a strong industrial infrastructure and associated development. Rising environmental concerns regarding reduction of industrial carbon footprint has led towards computer numerical controllers being increasingly used in place of manually operating machines. The competition is expected to intensify with new players entering the computer numerical controls (CNC) market on a regular basis, thus giving rise to a fierce rivalry between individual players.